"A wine pub? What's that?" you might be asking yourself. I asked myself the same question when I first got a sniff of the new restaurant's opening. I hadn't heard the two words used together before but the blend was intriguing. 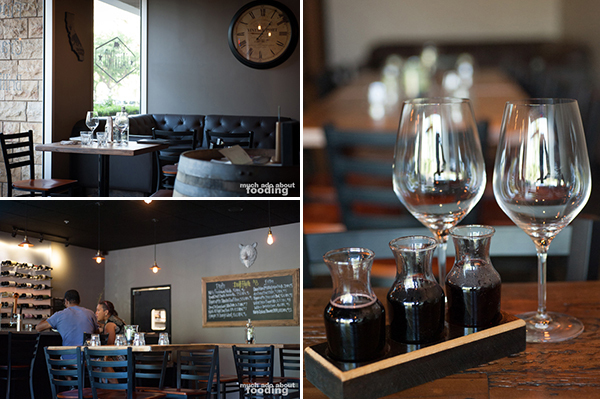 Calivino Wine Pub opened May 10, 2014 but apparently already has regulars. It's located near Angel Stadium and is nestled among other eateries that I would not expect to be nearby such as a Subway and Hooters. However, this also manages to give the area a place Anaheim does not really have for wine aficionados in the community - good food and a decent wine list experience. We stopped in one day to meet Owner Daniel Bradley, check out the digs, and delve into what was making Calivino already a popular hangout spot for the locals. A purposefully quaint space, Calivino has the feeling of a hospitable large living room that just so happens to have tables, chairs, and a bar inside. One back corner holds the spot of the kitchen door, and the three remaining corners are outfitted with curved lounge furniture with low coffee tables for those guests who are disinclined to sit at a table. Along the walls stand lower tables and in the middle are higher tables level with the bar seating. 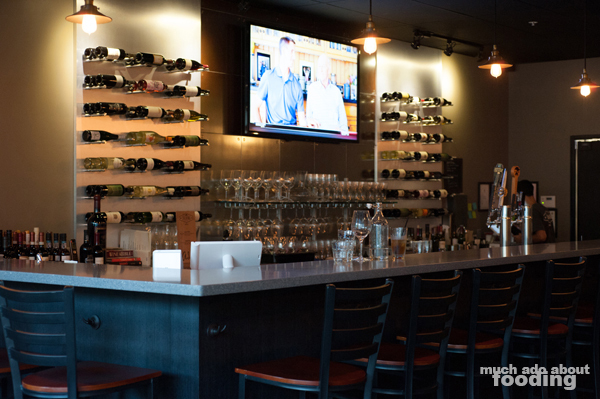 It looked to be a capacity of approximately 50 guests or so, and instead of a typical bar that is framed by draft beer tap handles, this one featured a brilliant and chic wine rack wall for the pourers (are they really bartenders with wine...?) to reach for. What made it lean more on the "pub" side of the name was the decor which tilted towards blacks, wood, California pride, and antique. Of course, there was the pub-necessary chalkboard as well. The menu we took a look at included sections called Bites, Plates, and Sweets, and the wine list was separated by reds, whites, sweet, and sparkling. Their most popular appetizer was the Bacon-Wrapped Dates but we wanted to try something a little less common. 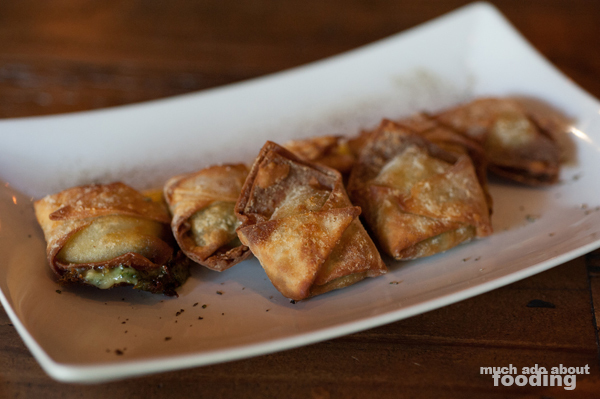 One of the owner's favorites was the Spinach Wontons ($8 - creamy baby leaf spinach with Parmesan) so we opted for these pockets of fried goodness. They were quite stuffed and reminded me of the spinach dip that most places serve with chips but in a more creative way. The wonton skins were deep-fried so they had a good crunch to them but the gooeyness inside made it worth the bites. 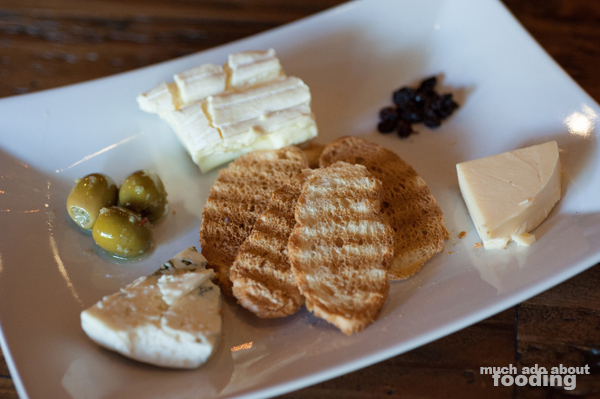 We also went for their Cheese Platter ($12 - three assorted cheeses) which rotates based on availability. 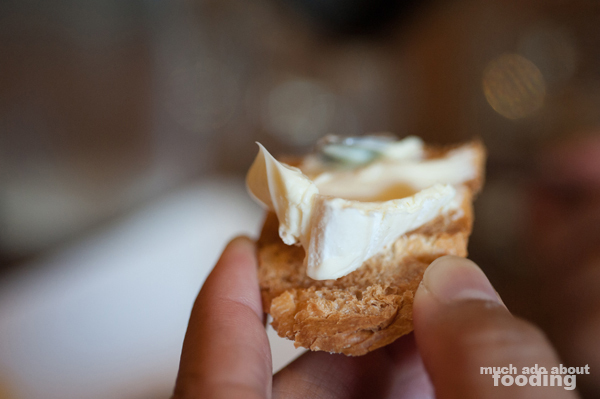 On our particular day, our selection was of Smoked Gouda, Bleu cheese, and Brie; tasty! I especially liked that the platter had dried currants as accompaniments. To pair with these appetizers, we opted for their daily red wine flight line-up ($14) which gives guests three rotating wines in miniature carafes to try. There is a white wine flight as well, and interestingly enough, all of the wines listed came with their own tasting notes. After the heavy starters, we began the entree courses with Calivino's Summer Salad ($10 - arugula, yellow peach, goat cheese, and radish), a plate heaped high with arugula and fit only for someone who really loves the bitter green. It seemed a tad under-dressed to me but the freshness couldn't be beat. The goat cheese was a nice touch and helped the leaves stick together. 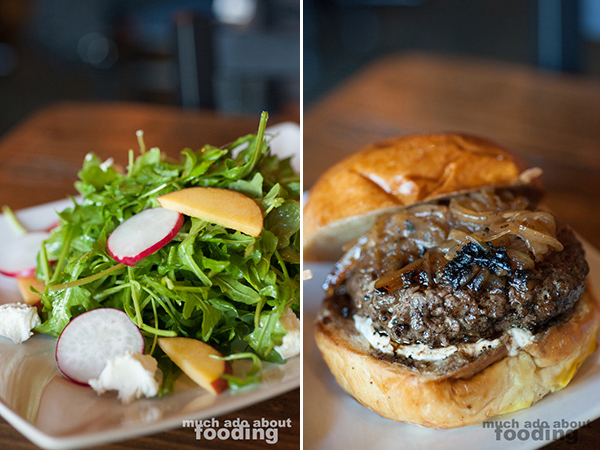 When we dove into the meaty dishes, they were some of Daniel's favorites as well - the Lamb Burger ($13 - mint, garlic, onion jam, gremolata yogurt) and Short Rib ($17 - roasted roots, root puree, melted celery, demi-glace). The menu items certainly did not fluff up the dish names here! It was also neat to see that gluten-free items were marked for guests' knowledge. If you're looking for the most popular entrees here though, they would be the House Burger and Grilled Cheese. The lamb burger is an order that will get all over the place. Because of the thick ground lamb patty and copious caramelized onions, the juices seeped through the bottom of the bun after a few bites which can prove an issue for some. However, the flavor makes up for it. Meaty, savory, and satisfying, this burger had a lot of good components going for it. I especially enjoyed how the gremolata yogurt kept any potential heavy-set feelings in check by cutting through the meat's weighty mouthfeel. 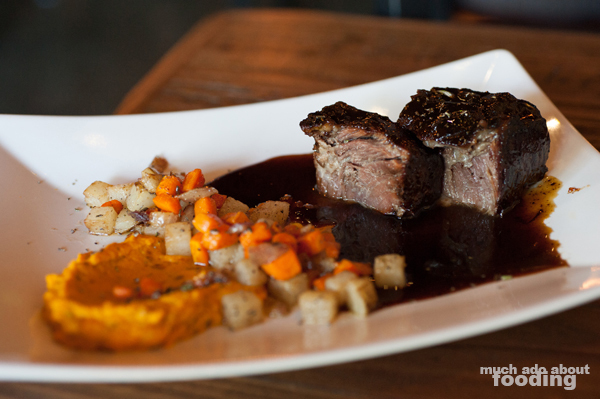 As for the short rib, I practically hoarded the plate to myself after tasting the demi-glace. The roasted roots and root puree had too much rosemary and thyme scattered on top for my taste but who needs vegetables when you have short rib? Tender and perfectly coated in the thick glaze, the sizable chunk of meat was a real treat. It was surprisingly easy to decide to order a dessert after the meal. Our server Matt thumbs upped our choice of the Panna Cotta ($6) because the type changed weekly and it was peach for our visit. That meant that there was peach on the side and peach on the inside. My kind of dessert! I've also heard that the beignets which come with lemon anglaise are good as well but we were feeling like something creamy that evening (P.S. the owner's favorite is the bread pudding). 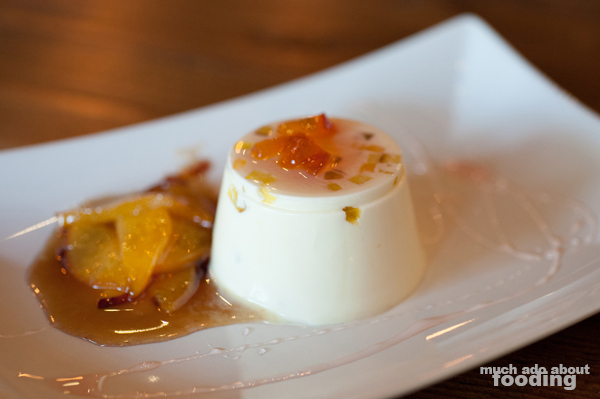 The verdict on this molded alabaster dessert? It was quite good and well put together but much too thick to be considered a pannacotta. I noticed it right away when it was set down - no jiggle. The creaminess and texture was more akin to flan but while the naming was off, the taste was still divine. Smooth and tinged with the scent of the peaches in addition to their inclusion, the pannacotta was a fine choice. I especially liked the subtle drizzle of what tasted like rosewater syrup on the plate and atop the mound. 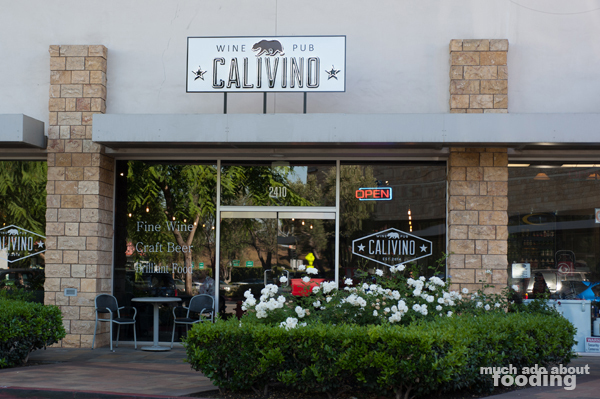 If Calivino sounds like the place for you, find them at 2410 East Katella Avenue, Anaheim, CA 92806 in the plaza. It seems to me like the perfect spot to relax with a glass of wine, some shared plates, and friends without any wine snobbiness. Anaheim needed a place like this.